Happy Wednesday, friends! Today I'm sharing some ideas for Easter baskets for boys. Next year I'll be sharing ideas for girls too! I always try and put fun things in their baskets, however, it's also a great opportunity to sneak in some essentials. They get excited about a new swimming suit and shoes when they are tucked inside the basket! 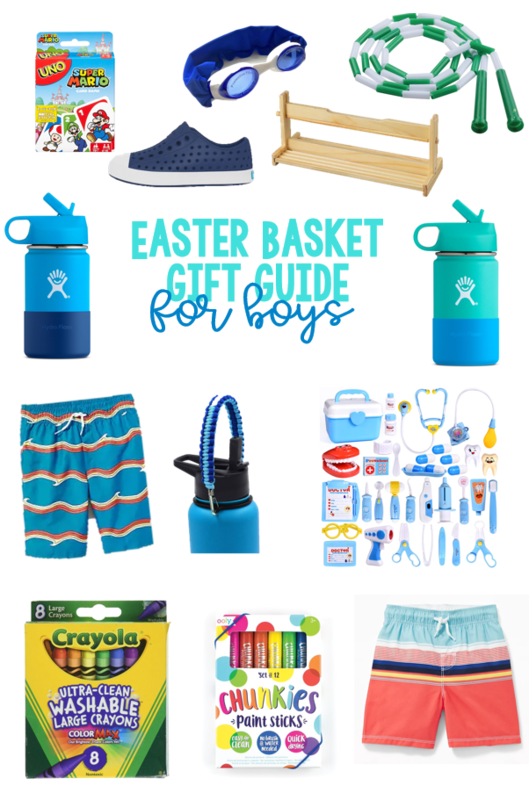 I know that Easter is only a few days away, but this might give you some ideas for upcoming birthdays or if you order off of Amazon, it will arrive just in time! New Natives are a spring essential for the boys! My favorite are the navy ones. In the past, Colson has picked his own out but this year they are both getting navy! I like Natives over other similar shoes because they don't stink after the boy wear them. They are so easy to clean. I just throw them into the laundry room sink and let them soak. I can also take a magic eraser to them and they look great. They are easy enough to put on themselves. They can wear them in the water so they make great shoes for heading to the splash pad. Okay, I think that's enough about my love for Natives. A new bathing suit also makes a great basket filler. The boys need new suits but will be more excited about getting them in their baskets than just going to the store and picking them out. Colson would prefer a Pokemon suit and Peyton, a Paw Patrol suit, but Mama likes the patterned suits! This year the boys are getting new goggles. They both take swimming lessons and Colson always complains about the goggles pulling his hair. The reviews from these are amazing so we're going to try them out. I'm not sure that Peyton will actually wear his but he wants whatever his brother has so they will both get a pair! Colson is getting a jump rope this year! He loves being outside and he's been learning to jump rope during PE at school. This was such an inexpensive gift and reminds me of the jump ropes we had in school. I've mentioned before that I'm trying to play more games with Colson and I think he'll love this Uno card deck! He's never actually played Mario Cart but he talks about it. This will be a fun set to play! Colson and Peyton have been sitting at the counter to color lately and I ordered them this paper roll. I can't wait to give it to them. It was inexpensive and we can leave it in dinning room for them to pull out and color away. I ordered several extra rolls of paper also. Peyton will be getting these crayons. Colson will be getting these paint sticks! I love this doctor kit! Colson had a doctor kit when he was about Peyton's age and played with it all the time. I think Peyton would get a lot of use out of this! Last summer I bought myself a hydroflask and I love it. It keeps my water cold all day. With the boys wanting to be outside all day and going to the splash pad, their water doesn't stay cold. I love the kids sized hydroflasks! Of course Colson and Peyton would each need a different color so they could tell them apart! I also love these handles so they are easier to carry! I hope you were able to get some ideas! I can't believe Easter is Sunday!